Spring is a special time for all motorcycle lovers to rev up their engines. In it is so big at our church that last Sunday after services one of our pastors did the blessing of the bikes. Yes, it is a thing. I guess that they are thinking of all bicyclists being safe. Here in the Midwest, they are more likely to be on road. Anyway, I thought it was a perfect time to dig out the One Wild Ride stamp set. 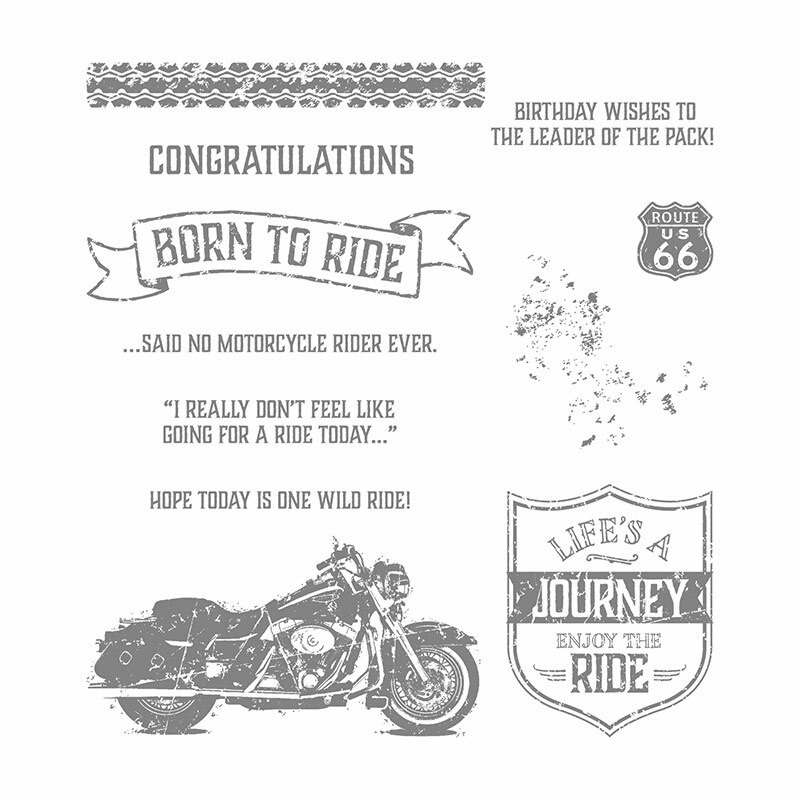 What a great motorcycle card for all the motorcycle lovers. I find using my Stamparatus helps to make the black standout because I can reink it as needed. It is a super easy card to make. Do you have the Stamparatus? It really is a must-have tool. You order it by clicking here https://www.stampinup.com/ecweb/default.aspx. Well ordering it make sure you are ordering the 2017-2019 Stampin’ Up! In Color Products as the ar retiring. This means the reinkers, cardstock, embellishment, and any designer series paper that has those colors in it. The official Retirement List comes out April 15th. This morning Stampin’ Up! announced some changes. I am thrilled over the changes because Stampin’ Up! is always announcing new innovations like within the last year we received Distinctive stamps. So Stampin’ Up! is discontinuing the Trimmer and Big Shot, a new style will be becoming. So if you don’t have either one this is the time to pick it up along with the accessories.